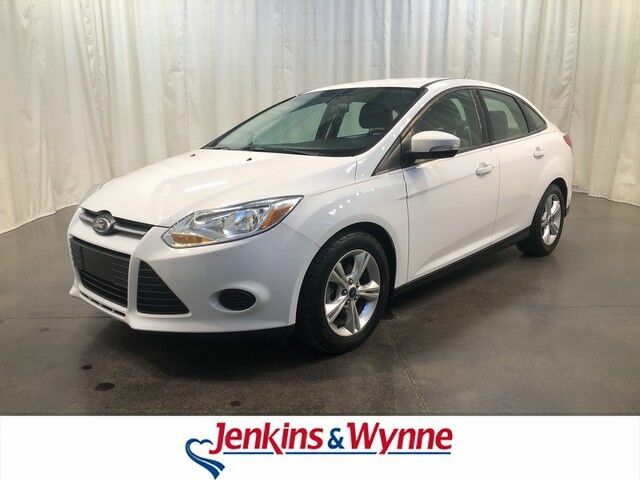 Contact Jenkins & Wynne today for information on dozens of vehicles like this 2014 Ford Focus SE. The Ford Focus SE speaks volumes about it's driver, uncompromising individuality, passion for driving, and standards far above the ordinary. It's exceptional fuel-efficiency is a clear sign that not all vehicles are created with the same standards. This is about the time when you're saying it is too good to be true, and let us be the one's to tell you, it is absolutely true. Beautiful color combination with Oxford White exterior over Charcoal Black interior making this the one to own! More information about the 2014 Ford Focus: The Ford Focus is a small car that offers a number of features otherwise seen in larger or more luxurious vehicles. For instance, the Focus is the first vehicle in its class to offer Active Park Assist, which can actually guide and steer the car into a parking space if the driver moderates speed with the brake. It's also the first small car to offer Ford's MyFord Touch system, which relies on a sophisticated touch-screen system and has advanced voice-command features and can even provide WiFi for the car and the area surrounding. Technology aside, the new Focus stands out from the class for its excellent handling and poise, sporty driving feel and impressive fuel economy. Strengths of this model include handling and poise, fuel-efficient powertrains, choice of hatchback or sedan, sleek, charismatic style, sport-oriented ST model, fully electric Focus available, and Innovative technology like Active Park Assist and MyFord Touch TEXT: 214.914.1866 CALL: 931.538.7505 EMAIL: Sales@JenkinsAndWynne.com. Our pre-owned come w/ an oil change, windshield wiper fluid check, 50k mile compression check, atleast a 32pt inspection sheet, the AutoCheck vehicle report, and a 12month/12k mile power train warranty (on a vehicle w/ 80k miles or less/10 years or less/ excludes Diesels, also excludes Bargain Corral Vehicles). This is already over a $200 savings to you! Jenkins & Wynne has been proudly serving the Clarksville area since 1953! This 2014 Ford Focus SE is a 4 door 2.0L front wheel drive sedan! This beauty has tan cloth interior, CD player, power locks and windows, hands free talk and more!! !